This is a bit of a long post, but there is a lot to cover. In a previous post, I walked through the deployment of Photon Platform v1.2, which included the Photon Installer, followed by the Photon Controller, Load-Balancer and Lightwave appliances. If you’ve read the previous post, you will have read that Photon Platform v1.2 include the OVAs for these components within the Photon Installer appliance. So no additional download steps are necessary. However, because vSAN is not included, it will have to be downloaded separately from MyVMware. The other very important point is that Photon Platform is not currently supported with vSAN 6.6. Therefore you must ensure VMware ESXi 6.5, Patch 201701001 (ESXi650-201701001) is the highest version running on the ESXi hosts. The patch’s build number is 4887370. One reason for this is that vSAN 6.6 has moved from using multicast to using unicast, which in turn uses vCenter for cluster membership tracking. Of course, there is no vCenter in Photon Platform so a way of handling vSAN over unicast membership is something that needs to be implemented before we can support it. Now, I have already blogged about how to deploy vSAN with Photon Platform 1.1. However, some things have changed with Photon Platform 1.2. With that in mind, let’s go through the deployment process of vSAN with Photon Platform version 1.2. As before, I have 4 ESXi hosts available. 1 of these will be dedicated for management and the other 3 will be cloud hosts for running container schedulers/frameworks. These 3 hosts will also participate in my vSAN cluster. This has already been covered in a previous post. It is a simple OVA deploy. Place it on the management ESXi server. I used the HTML5 client of the ESXi host to deploy it. In the last blog on PP 1.2, I showed how there is a new deployment method called “photon-setup“. It takes as an argument a YAML file, with various blocks of information for Photon Controller, Load-Balancer and Lightwave. Refer back to the previous post to see a sample YAML config for Lightwave. 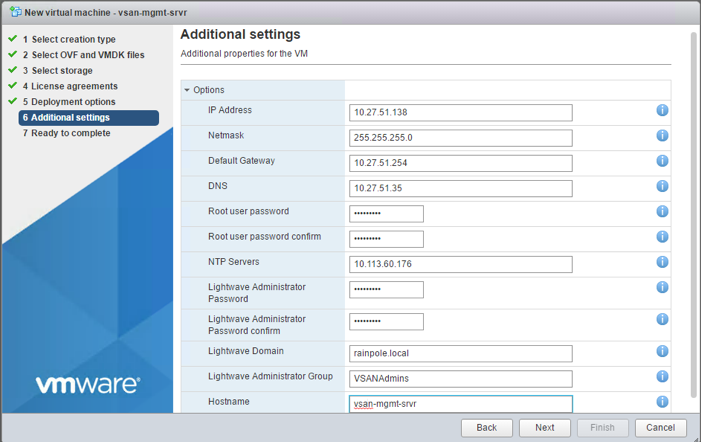 As we need Lightwave to authenticate the vSAN Manager Appliance against (more on this later), we can just deploy out the Lightwave appliance for now. 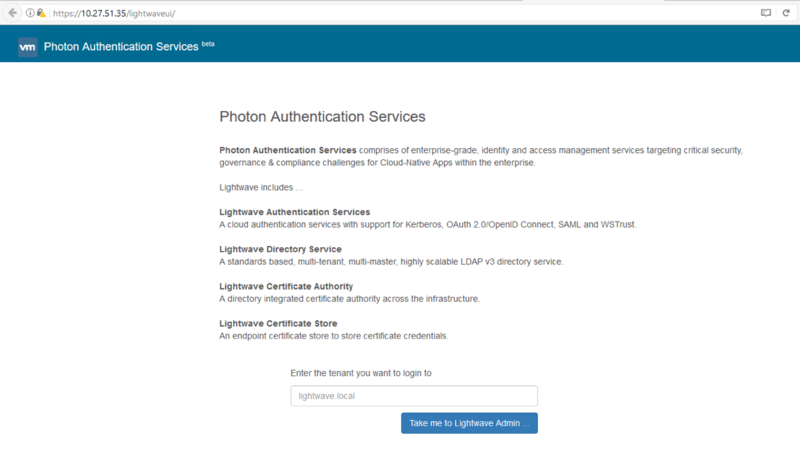 Lightwave is essentially the photon platform authentication service. The following command will just pickup the Lightwave part of the YAML file and deploy it. 2017-05-25 09:06:24 INFO Info: Lightwave already exists. Skipping deployment of lightwave. COMPLETE: Install Process has completed Successfully. We can then verify that it deployed successfully by pointing a browser at https://<ip-of-lightwave>. Add the Lightwave domain name (which you provided as part of the YAML file) and then provide login credentials (also specified in YAML) and verify you can login. If you can, we can move to the next steps. A few things to point out here. The DNS should be the Lightwave server that you deployed in step 2. The Lightwave Domain is the name specified in the YAML file. Administrator Group (VSANAdmins) is the group you created in Step 3 (bit of a gotcha here – I’ll discuss it in more detail in step 5). Hostname (last field) actually refers to the name of this vSAN Management appliance that you are deploying, although it seems to be located with Lightwave information. Once the appliance is deployed, open an SSH session to it and login as root. Now we come to the proof of the pudding – can we authenticate using the credentials above, and build our vSAN cluster using RVC, the Ruby vSphere Console. 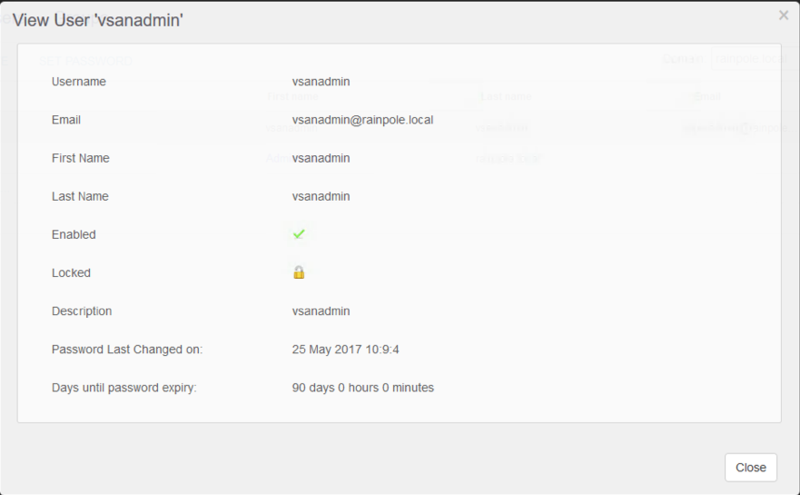 After making those changes, you can now see if your RVC session with authenticate using the “vsanadmin” user which is a member of the VSANAdmins group created back in step 3. Success! OK, now we are ready to create a vSAN cluster, but first we need to setup the network on each of the 3 ESXi hosts that will participate in the vSAN cluster. 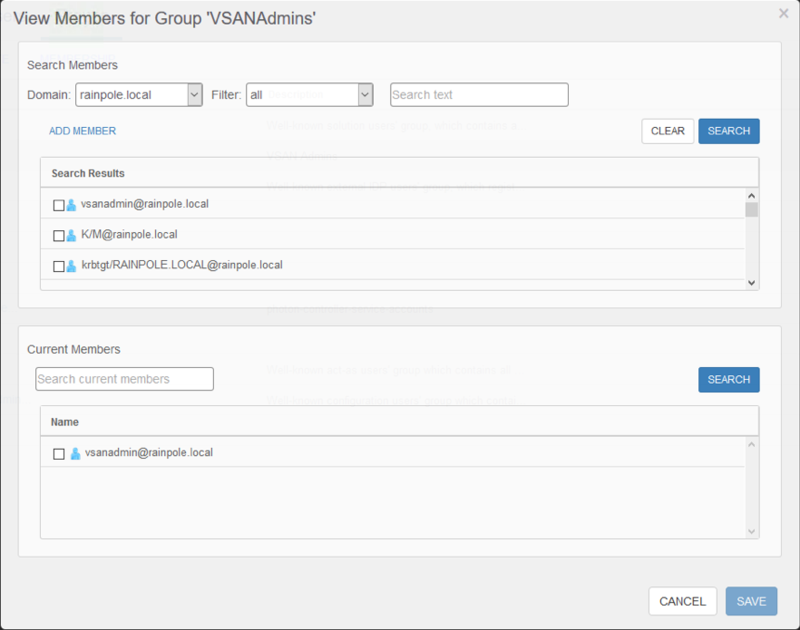 The following are the commands used to create a vSAN portgroup, add a VMkernel interface, and tag it for vSAN traffic. These are run on the ESXi hosts and would have to be repeated on each host. Note that I used DHCP for the vSAN network. You might want to use a static IP. And of course, you could very easily script this with something like PowerCLI. OK – the vSAN network is configured on the 3 x ESXi hosts that are going to participate in my vSAN cluster. Return to the vSAN Management Appliance, and the RVC session. These are the commands that are run to create a cluster, and add the hosts to the cluster. I also set the cluster to automatically claim disk for vSAN. 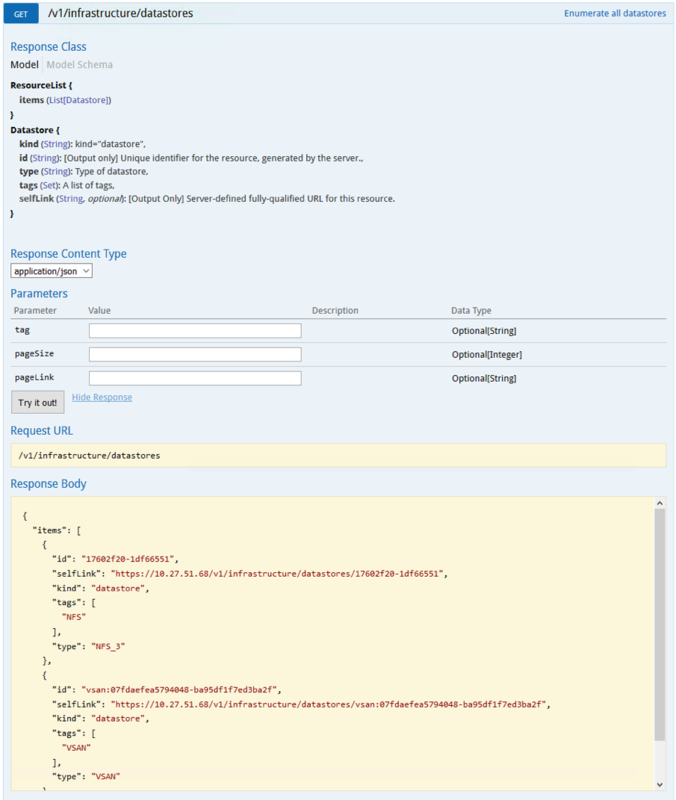 No host specified to query, stop current operation. Looks like it worked. All 3 x ESXi hosts have been successfully added to my cluster. Let’s now run a few additional RVC commands to make sure the vSAN cluster is formed and the vSAN health check is happy. This looks good. The Member UUIDs show 3 members in our cluster. vSAN is enabled, and each host has claimed storage. It is also a good idea to run the health check from RVC, and look to make sure nothing is broken before continuing. OK some issue with HCL DB file (it is out of date and I should update it) and something about consistency. Not sure what the latter one is at this point (still investigating), but overall it seems to be OK. Great, I can now go ahead and deploy the remainder of the Photon Platform components (load balancer, photon controller, agents for ESXi hosts. First of all, I am going to make some modifications to my YAML file to ensure that the vSAN datastore is added. To do this, just make sure that the vSAN datastore is added to the list of allowed-datastores, e.g. allowed-datastores: “isilion-nfs-01, vSANDatastore”. Don’t worry if you do not get the spelling right – you can always modify the name of the datastore later on to match what is in the YAML, and Photon Platform will automatically detect it. Now we pop back onto the photon installer and rerun the photon-setup command seen already, but this time for the platform. Since the Lightwave appliance is already deployed, that part will be skipped. I have included the whole of the output for completeness. 2017-05-25 09:48:16 INFO  Info: Lightwave already exists. Skipping deployment of lightwave. The deployment has completed successfully. The final step in all of this is to make sure that I can see the vSAN datastore (and the NFS datastore) from Photon Platform. First off, I can use the UI to determine this. Point a browser at https://<ip-address-of-load-balancer>:4343, login with lightwave administrator credentials and see if both datastores are present. That looks good, doesn’t it? I can see both the NFS datastore and my vSAN datastore. Cool! Now I’m ready to deploy an scheduler/orchestration framework. Kubernetes 1.6 is now supported, so I think I’ll give that a go soon. Make sure the ESXi version is supported. If you try to use a version that support vSAN 6.6, you’ll have problems because we cannot handle membership using unicast without vCenter at this point in time. The issue with the vSAN manager OVA credentials highlighted in step 5 caught me out. Be aware of that one. If you misspell the name of the vSAN datastore, it won’t show up in Photon Platform. However you can always change it to what is in the YAML file, and Photon Platform will pick this up once they match (within 15 minutes I believe). This does work, as I had to do exactly that. Although the vSAN RVC health check command reported some inconsistency in the output, it does not appear to have any effect on the overall functionality. We’re still looking into that one. Thanks for reading this far. Hope you find it a useful reference.